To make the cake, preheat oven to 350°F. In a mixing bowl, whisk together cake flour, sugar, baking powder, baking soda, and salt. Using the paddle attachment of a stand mixer or a hand mixer, blend in unsalted butter until it's well-mixed into the dry ingredients. It should resemble a coarse sand. In a separate bowl, stir together eggs, buttermilk, and vanilla. Add wet to dry ingredients and mix until just combined. Try not to over-mix. Butter and flour a 9 inch cake tin and pour batter into tin. Bake cake for 35-40 minutes at 350°F until the cake is set and a tester comes out clean from the center. It should be nicely browned on top. Let cake cool for a few minutes and then break it into pieces. For filling, whisk together eggs, sugar, and yogurt in a medium bowl. In a small saucepan, whisk together milk and cornstarch over medium-low heat. Continue to heat until the mixture is steaming and thick. Whisk hot milk mixture into yogurt mixture. Stir in vanilla. Cool in the fridge for 2-3 hours until the custard is thick and set. For ganache, add all the ingredients to a microwave safe bowl and microwave on high in 20 second bursts until the mixture is melted. 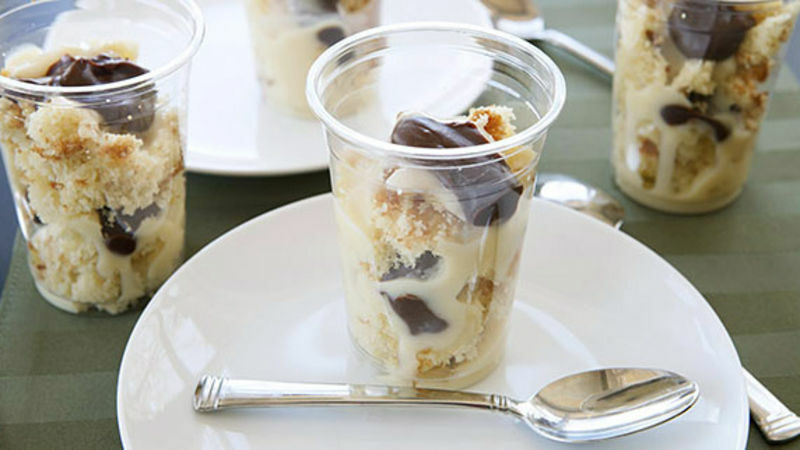 To make the cups, add some cake to each glass/cup, then top with a spoonful of vanilla custard, and then a small spoonful of chocolate ganache. Repeat the layers in each. Chill cups until you serve them. Every city is known for a food. New York has pizza and cheesecake. Chicago has hot dogs. Atlanta has BBQ. Boston has a bunch of specialty foods, but I always think of Boston cream pie: A thick vanilla custard layered between light cakes and covered with chocolate ganache. Yes, please! If you like the flavors but are in the mood for something a bit more casual (and portable) try out my Mini Boston Cream Pies. All of the same ingredients, but layered in individual cups. Obviously, you’ll need some cake for this recipe. You could make it from a box or pick up a cake from a bakery, as any light white cake will do the trick. If you want to bake your own though, check out the recipe where I give directions for a quick and simple cake. You start by blending some butter into the dry ingredients until it resembles coarse sand and then adding all the wet ingredients. You don’t want to over-mix the batter. Butter and flour a 9-inch cake pan and pour in your batter! This cake will need to bake for 35-40 minutes at 350 degrees F. It should be nicely browned on top. Let this cake cool and then you can crumble it up for your cups! On to the filling, which is my favorite layer in the cups. I took a little shortcut for this version and used some Yoplait Boston Cream Pie yogurt for the filling. Whisk together the eggs, yogurt, and sugar in a mixing bowl and then stir together the milk and cornstarch over medium-low heat in a small saucepan. Once the milk mixture is thick and steaming, whisk it into the egg mixture. Stir in the vanilla at the very end, and the filling is done. This filling will be best if you let it chill for a few hours to thicken before using it in the cups. When you’re ready to make the cups, just crumble some cake into each cup. Then add a spoonful of cream and chocolate ganache. Repeat the layer again (cake, cream, chocolate). Chill these guys if you are making them in advance. One of these cups is about the equivalent of a small piece of pie. You get all the flavors in a nice portable little cup. These would be great for any kind of party and theyr’e pretty easy to make. Give them a shot if you’re a cream pie fan! Nick thinks cake in a cup is always a good idea! Be sure to check out his blog, Macheesmo, and follow him on his Tablespoon Profile.